Guanacaste is a province of Costa Rica in Central America. It is situated on the upper Pacific Coast in the Northwest part of the country of Costa Rica. Because of the unique climate in this region it is very popular for travelers as well as expatriates. There are significantly more days of sunshine annually than the other parts of Costa Rica such as the Southern Coast and the Caribbean Coast. This makes for more beachgoing, more golf, more everything outdoors that we all love doing in the sun. Notice that June and September are spike months for rain. It’s important to note that even a day with rain in Costa Rica can be a wonderful day of activities because rainfall tends to begin in the afternoon and tapers off before dark. That said let’s take a look at the highlights of this popular region of Costa Rica. Liberia is the capital of the Guanacaste province. Besides being a charming town with colonial architecture, Liberia may be best known for its international airport. Opened in 1995 Liberia International (LIR) reduced the ground travel to the beaches of Guancaste from around 4 hours (from San Jose) to around 45 minutes (from Liberia). If you have the chance spend a day in Liberia exploring its history and culture. And you likely may be arriving and departing Costa Rica through Liberia. Check out (LIR) when you’re reserving your flights. Beaches in Guancaste are generally the best in Costa Rica. White sand and tree-lined beaches are particularly plentiful in Guanacaste. Depending on your particular taste there’s a beach town for you. Tamarindo is a tourist beach for both gringos and ticos alike. Some of the best surfing in Costa Rica is here, lots of quality lodging options and restaurants, and bars galore. This town has been developed rapidly and continues to grow. A more refined option is Playa Flamingo where high-dollar houses and condos have amazing views of the Pacific Ocean. Here you’ll find great sandy beaches, upscale dining and hotels, but without the all-hours of nightlife. This might be considered a more romantic getaway for most. A more rustic, natural setting with fantastic beaches can be found in Nosara on the Nicoya Peninsula. Nosara is quieter and less traveled. On Playa Nosara you may find spots on the beach to be alone for the day. This is a gem of Guancaste for sure. 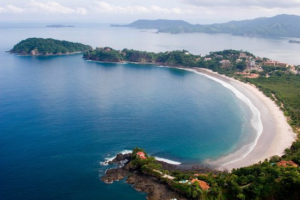 Nicoya is a quaint colonial town that tourists often pass up because they want to get to the coast and the beaches. But this is real Costa Rican culture where you can relax walking along the cobblestone streets or resting under the trees in Parque Central. There’s original colonial architecture that remains intact today. This natural area offers a little of everything: beaches, waterfalls, 4 volcanoes (Santa Maria, Orosi, Rincon de la Vieja and Miravalles) and protected lands make “The Rincon” a highly attractive destination with nature lovers and adventure travelers. This is a one of the oldest and most popular parks in Costa Rica. Contained within the park is one of the last tropical dry forests to be found anywhere. This park is quite diverse featuring forests made up of evergreens, mangrove swamps and flat savannahs. There are very remote beaches here and many surfers visit he area to surf the breaks at Witches Rock and another called Ollie’s point. Guanacaste National Park has trail systems that traverse completely different ecosystems. There is an abundance of birdwatching. There are 2 volcanoes in the park: Volcan Orosí and Volcan Cacao. It’s truly a hikers paradise with elevation changes, volcanoes and hundreds of species of animals. Click here for hundreds of tours and excursions to choose from when you visit the province of Guancaste in Costa Rica.